Have you ever made one of those meals that is pretty time intensive and involved, but when it all comes together and you sit down to eat it’s like the entire meal comes together perfectly and you hear the Hallelujah Chorus playing in the background as you take a bite? No? Well, that’s what happened here. In all fairness, I can’t take too much credit for this meal. 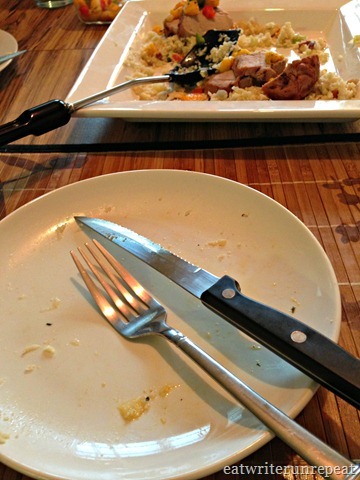 The Man made most of it – I just made the almond-cauliflower-rice-pilaf. After he had done most of the prep work, that is. 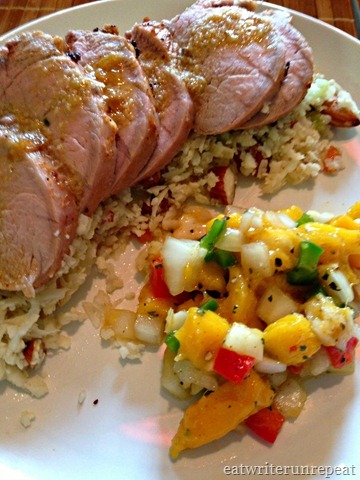 The Man started searching for recipes, and he came up with one in particular from The Food Work: Emeril Lagasse’s “Pan-Roasted-Lime-Marinated-Pork-Tenderloin-with-Mango-Salsa-and-Almond-Rice-Pilaf.” How’s that for a mouthful? Anyway, because we are doing the Whole30 (and because The Man doesn’t really measure anything when he cooks), we made some tweaks to the original recipe. 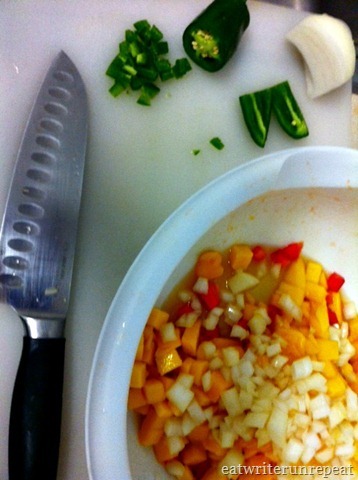 He added mango, onion, red pepper, jalapeno, garlic, lime juice and apple cider vinegar, sprinkling it with some powdered ginger and the barest hint chipotle chili powder before moving on to the pork marinade. Aside from some measurements, the only real change he made to the marinade was substituting fresh squeezed orange juice for the honey in order to make the recipe Whole30 approved. I’m guessing the honey might have made the marinade a little bit stickier, causing it to caramelize on the pork as it cooked, but ours was so good I really can’t imagine it could get any better! Just look at that gorgeous piece of meat! 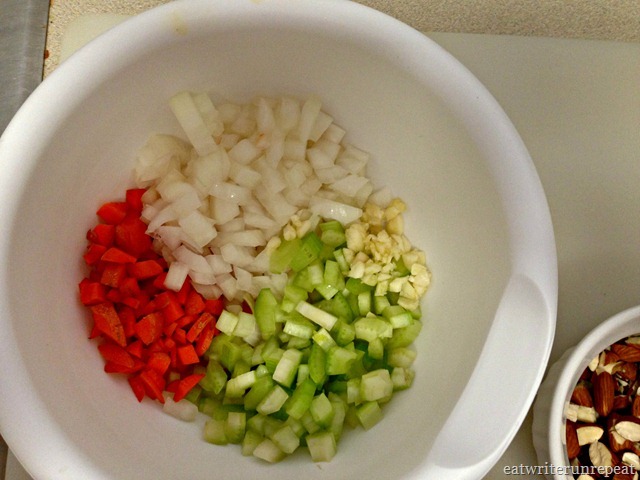 When I got home from work The Man had the add-in veggies chopped for the rice, all I had to do was grate the cauliflower and throw everything in the pan. Pretty simple! 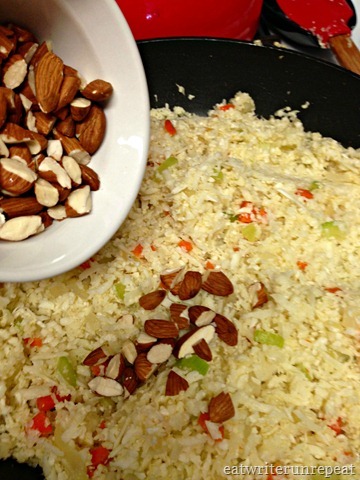 The recipe was quite similar to my indian pilau rice and my cauliflower fried rice. I had the added benefit of using fresh chicken stock leftover from the Roast Chicken we made for dinner on Tuesday night. The recipe may have been a little more time-intensive than we’re used to, but WOW was it worth it! Not only does it look gorgeous (if I do say so myself), but it tasted phenomenal. The pork had a delicate lime flavor that was balanced with the sweet and heat of the salsa, which paired perfectly with the rice. It just came together so well. 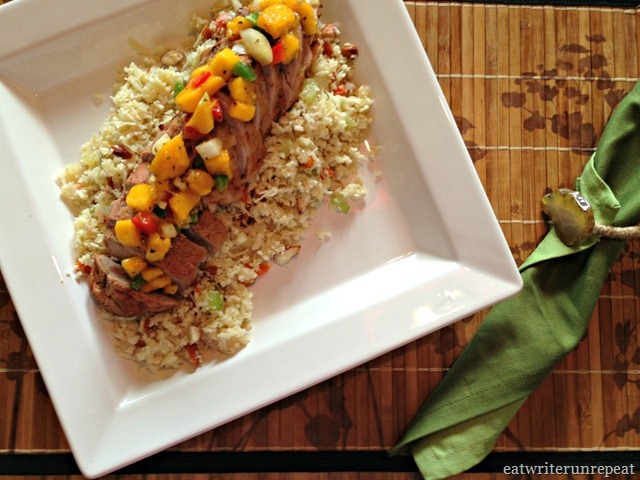 We definitely put this recipe aside to make for the next time we have company! 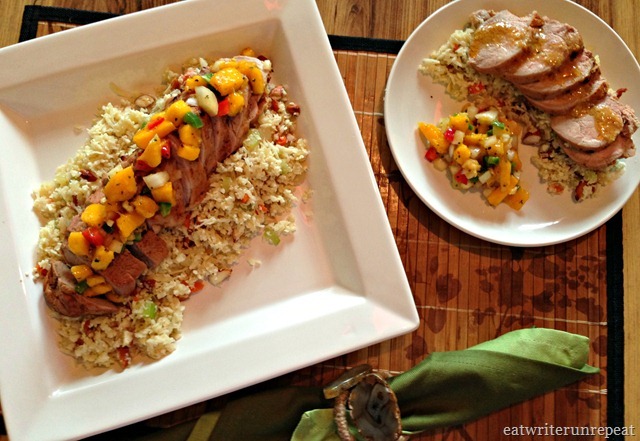 Posted on 10 August 2013 1 October 2015 by BeePosted in Dinner, Pork, Side DishesTagged almonds, cauliflower rice, dinner, emeril, mango salsa, pork tenderloin. Previous Previous post: Lost Rhino Brewing Co. Sounds like a recipe for when W and I visit you next! 🙂 Looks awesome!! And then you can come over and I’ll make deep sea dory for you two. Deal? 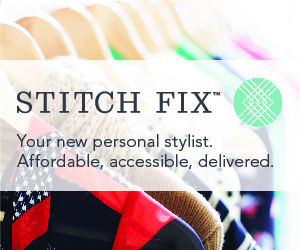 Pingback: Whole30 Week One Round-Up | eat. write. run. repeat! 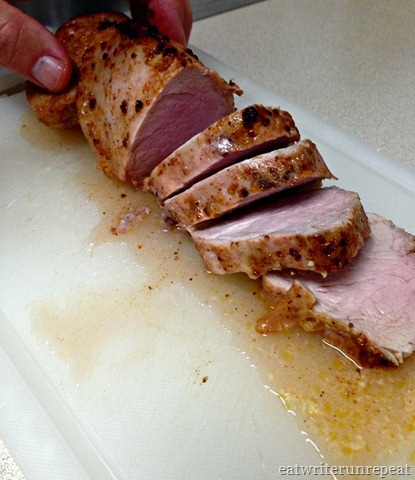 Pingback: Whole30 Roundup Week Five: What We’ve Been Eating | eat. write. run. repeat!